AUTHOR INFORMATION: Bill Hussey gave up a career in law to study creative writing at Sheffield Hallam University where he earned a Masters Degree. 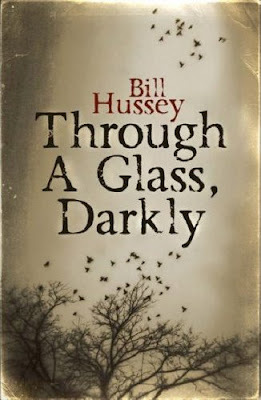 “Through a Glass, Darkly” is Bill’s first novel and was inspired by the lonely Fen villages of Lincolnshire and a lifetime devoted to the horror story. PLOT SUMMARY: Detective Inspector Jack Trent, the most effective CID officer in the history of the department, is having bad dreams. He has seen the murder of a child in a forest clearing at the hands of something indescribable. But these are more than dreams. They are visions of the future that Jack has tried for years to suppress. For something happened to Jack in his childhood; something that means he cannot touch another living person, that killed his mother, and that has returned to haunt his mind. Now, in a race against time, Jack must make his stand and try to save Jamie’s life. But doubt remains. Can he face the mysterious Dr. Mendicant and the ancient Darkness of Crow Haven? Can he face the evil living inside himself? And what will he make of the Doctor’s final, devastating revelation? CLASSIFICATION: Reminiscent of 80s era Clive Barker, Stephen King, Robert R. McCammon, Peter Straub and Dean Koontz, “Through a Glass, Darkly” is a traditional, yet chilling blend of police procedural, suspense, dark fantasy and supernatural horror that see-saws between the psychological and the macabre. FORMAT/INFO: Page count is 448 pages divided over fifty-eight chapters, an Epilogue and seven Days—Friday 25th October 2002 through Thursday 31st October 2002—that are denoted with quotes from the Bible and famous persons/books. Narration is mostly in the third-person via several different POVs of characters both major and minor, but there are also a few first-person past-tense accounts. “Through a Glass, Darkly” ends in a manner that would make it difficult to write a follow-up, but characters like Jack Trent and Dr. Mendicant are tailor-made for sequels. July 10, 2008 marks the UK Trade Paperback publication of “Through a Glass, Darkly”, the second release through Bloody Books (after Joseph D’Lacey’s Meat), a new horror imprint of Beautiful Books Limited. Cover designed by Head Design. ANALYSIS: My love for horror can be traced back to the 80s when I grew up on a steady diet of such films as Friday the 13th, A Nightmare on Elm Street, Poltergeist, Halloween, Creepshow, Hellraiser, Child’s Play and so on, and was cemented by the early works of Dean Koontz, Clive Barker, Robert R. McCammon, and Brian Lumley. Which probably explains why I enjoyed reading Bill Hussey’s debut novel so much. Because as far as tone, style, and subject matter, “Through a Glass, Darkly” is highly reminiscent of the decade, movies and books that made me fall in love with the genre. That he can whisper to and take to his home in the wood. What I loved most about “Through a Glass, Darkly” though, was its depth. From Jack Trent, Father Asher Brody who has been fighting the evil of Crow Haven since 1976, the current pastor Father Christopher Garrett, Simon’s mother Anne Malahyde, Geraldine Pryce who taught Simon, and Mendicant himself to Crow Haven, the Redgrave Forest, the transmigration of souls, and the Yeager Library, every person, place and thing in the book has a story, and learning the history of each is one of the novel’s greatest joys. At the same time however, the frequent flashbacks hinder the main narrative which loses some of its immediacy because there is so much backstory. As far as the writing, “Through a Glass, Darkly” is quite impressive, especially for a first effort, and is very solid in all areas including prose, characterization, research, imagination, and plotting. My only nitpicks are the pacing which I thought could have been ramped up a bit, and creating a more distinctive narrative voice, but neither is a real concern in the book. I'm very excited about this book... it's on my stack of books to order from the UK. I think the stack is now at 6, so I'm sure I'll be ordering them soon.